We met at a Spread the Word workshop about performing poetry to an audience, and started going to open mic poetry events together, encouraging each other to try out the things we’d learned that day. It meant we got to study our differing styles – both in writing and performing – and realised that they complement each other because of those differences. A friendship formed and the idea of working on a project together started to float about. Hilaire was already writing co-authored texts with her partner Nick, so was keen to write her own work and for Joolz to write hers, rather than collaborating on poems together. She also wanted her poetry to engage with subjects outside her immediate personal experience, and Joolz was up for exploring that too. So we threw around some themes – two of which kept coming up again and again. Two major passions in common: an almost unhealthy obsession with London, especially our own individual patches of London – north and south of the river, where we each have lived for many years; and a strong belief that women’s stories and voices often go unheard. London Undercurrents was born – a joint project to explore our own patches of London through the voices of the women who have lived and worked there, real and imaginary, over the centuries. We met once a month at cafes around town to share new London Undercurrents poems as they emerged – each written in a different woman’s voice. The poems were strong, and we knew we were on to something. We were also both so polite with each other, hardly editing anything – maybe a comma or spelling but nothing more. We submitted pairs of poems to magazines and online. We featured at several poetry nights. People loved our project and kept saying ‘get it published’. But we felt stuck. We didn’t know how to move on to the next level – a full collection of razor sharp poems that did justice to the brave and wonderful women we were still discovering. Which is where Spread the Word stepped back in. The lovely Laura (Communications & Project Manager) met with us and gave us advice about applying for a Research and Development grant from the Arts Council, and we decided to go for it. Putting the bid together took the two of us six months, back and forth, tweaking, refining, and a lot of hard work interrogating ourselves about the ‘why and what’ of our project, before we could submit the bid. But it paid off. Our application was successful – hurrah! Then a new chunk of hard work began. The grant has paid for mentoring sessions with the brilliant and supportive Jacqueline Saphra, which have taken place in Spread the Word’s writing room at The Albany. Using this space has allowed us to focus on our project, without all the distractions of home or a crowded public place. 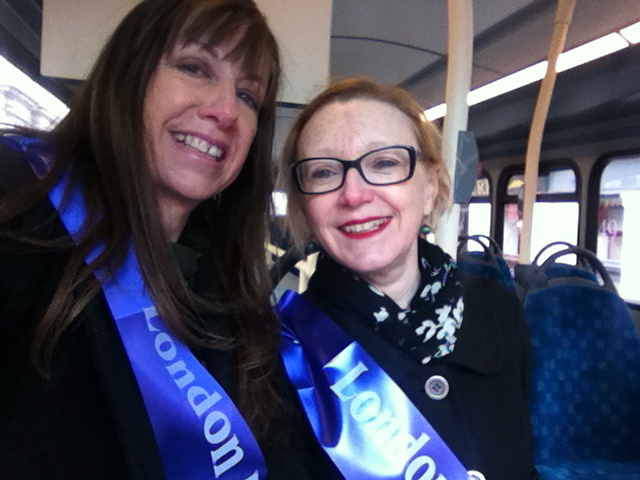 The funding has also enabled us to spend time researching in the London Metropolitan Archives and in our local libraries, plus take our poetry to wider audiences through featured readings and a guerrilla poetry event along the 19 bus route for International Women’s Day. The mentoring sessions in particular have been instrumental in improving our writing practice. Fuelled by the most delicious vegan chocolate cake in the world (official) and cups of coffee from The Albany café, we’ve pored over our poems and played around with different ways to structure our manuscript. Jacqui has encouraged us to critique each other’s poems; to read each other’s poems aloud as opposed to the poet reading her own work; to rewrite, edit, then edit some more; to think about form, and seek out the core of each poem. We’ve asked ourselves why we chose to focus on our immediate neighbourhoods; why that matters and what it brings to our joint collection. From our discussions, it’s become clear that while our focus is on two specific areas of London, the voices and stories we’ve uncovered have a much wider resonance, and that a thread runs through each woman’s story connecting them to us. We’re nearly at the end of our research and development period and we’ll be sad to say goodbye to our mentor and to time spent at The Albany. It’s been a time of growth, both professionally, as poets and writers, and as people. Time well spent.